Looking for a place to eat in Delhi? There are tons of places to eat in Delhi, and it varies from cheap food stalls to exclusive restaurants. The food varies from region to region; typical north Indian food, south Indian food, Kashmiri or Nepalese food. Hindus are the great chefs of vegetarian dishes, while the Muslims rule the kebab corners. It's all for you to try! Here are the restaurants we tried in Delhi. Street food is the most delicious and cheapest food you can get in India. Several food vendors selling vegetable curries, poori (Rs 2), chapati, Indian sweets like jalebi (Rs 10), chai tea (below Rs 10), fresh fruit (Rs 10), samosas or whatever can be found in most parts of Delhi. They're concentrated around markets, for example Chandni Chowk market, and also bus stands and train stations. Always steer away from food stalls that are not crowded. So follow the ones that are crowded. You should also ask them to not use ice in any juice you order. The ice is usually from tap water, and not from bottled water. We bought food and snacks from several food vendors in Old Delhi and New Delhi. And we were fine! 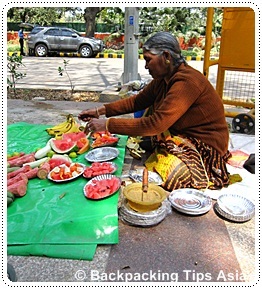 This nice old lady was sitting right outside Gandhi Museum with fresh fruit. Some business men walked up to her and bought fruit. She would slice it up and add some masala spices to it, which by the way is common in India. We ate at Sandoz on our last night in Delhi and India, before we headed home for Norway (March 2011). Since we were 5 girls, we decided to order different dishes and then share. Among the dishes were Aloo gobi (Rs 70) and paneer masala which was very delicious and mouth-watering especially the aloo gobi. It had a distinct taste and up today I still haven't forgotten about the food there. And it keeps getting better: the vegetarian dishes are cheap, below Rs 100. If you want meat dishes they range between Rs 100-300 (mostly chicken and mutton). The meat is fresh, and they can do a nice barbeque for you. The chicken dishes are why Sandoz is popular - that's at least what the manager told us. If you want to spend the night at a special place, I would recommend Chor Bizarre. This restaurant specializes in Kashmiri food, but they also have several Indian food on the menu, for example tandoori dishes. I tried the Tandoori Aloo (Rs 305) which was excellent. It was laid out in a special way, with nuts and potatoes. Quite delicious and it was worth the money. The restaurant was full when we arrived there, but we managed to get a table at the corner. Our waiter from Mongolia, was very helpful and friendly. The food didn't take unusual a lot of time. A warm atmosphere with elegance to it. It was voted as Best Kashmiri Restaurant in 2011. When we visited Raj Ghat, we made a stop-over at the restaurant close to the entrance. This is where travelers and tourists eat before they head for Raj Ghat. There was so many people there, and packed at the time we were there, so there's a high turnover rate. I ordered masala dosa which was good enough, and the other girls ate biryani with some white sauce containing corn. I had a taste of it, and it was good. Fresh rice, and fresh vegetables. But as you can see, it was huge so we never completed the meal.